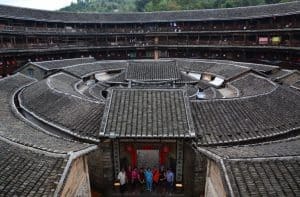 Tulou, or “earthen building”, is a traditional communal residence found in Fujian Province South China. Most of buildings were founded between 12th and the 20th centuries by Hakka people, usually of large, several stories high, and built along an inward-looking, circular or square floor plan. There are more than 23,000 tulous in Yongding city and 17,000 in Nanjing county, Zhangzhou. We offer tailor-made one day tour to both cities. • Nanjing Tulou Area is the most recommended, as it’s only 2.5 hours from Xiamen city. The popular sites are Tianloukeng cluster, Yuchang buiding, Taxia Vilage in Shuyang Country as well as Yushuiyao. 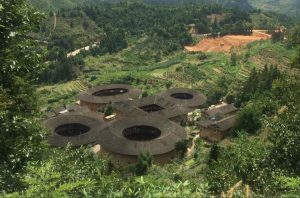 • Yongding Tulou Area is about 3 hours from Xiamen city, but it’s the largest tulou area in Fujian, with most of the top buildings and where the largest building is. Departure time: 9am or any time required. My driver and I will pick up from hotel at around 9am( or any time required), and take a 2.5-hour scenic drive to Shuyang in Nanjing. We will visit Tianluokeng Tulou Cluster and Yuchanglou(leaning structure Hakka house) when we arrive, and Taxia village after lunch . After short lunch break we will then travel to Gaotou Village in Yongding to visit Chengqilou, the biggest existing tulou. We will be able to leave for xiamen at around 5pm and arrive at Xiamen at around 8pm. Tianluokeng Tulou cluster: Tianluokeng Tulou Cluster are composed of 5 earthen buildings, with one square tulou at the center and circled by 4 circular tulous, forming a pretty pattern of so called “four dishes with one soup”.It is one of the most magnificent and well-preserved Hakka Castles in the area. Yuchanglou: Nickname “leaning buildin” or Eastern Pisa Tower. It is famous for its leaning pillars. Located in XiabanVillage, Yuchanglou was built in 1308 and is one of the oldest existing Tulou. The most extreme is slanted at15-degree angle. Yuchanglou has been like this for more than 700 years and remains intact today. ncestral Hall is listed among the key culture relics protected under national level. 400 rooms and used to house 80 families, totaling more than 600 people in its prosperous days. ended. Here are travel costs for your reference. A 5 seats car with a driver: 900RMB per day, 7 seats business van with a driver: 1000RMB per day. English speaking tour guide: 650RMB per day. Entrance tickets costs: Tianloukeng, Yuchanglou and Taxia village all together cost 100RMB per person. Chengqilou: 50 RMB per person. This is just one day trip, if you have longer than two days for Hakka villages tour, two days trip will be of more fun. Please contact me at mychinainterpreter@hotmail.com for multiple days tour.